"This is a tasty, crunchy snack and you can customize your seasoning based on your preferences. Dry-roasting is the key. Enjoy!" 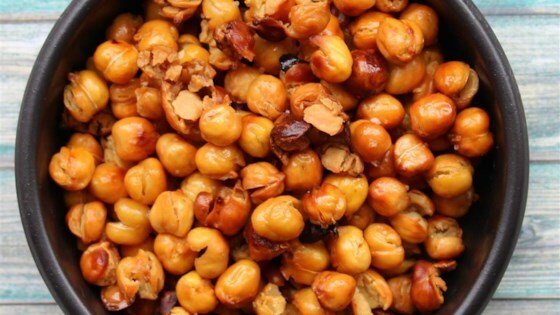 Spread garbanzo beans in a baking dish and pat dry with a paper towel. Bake in the preheated oven, stirring halfway through, about 22 minutes. Toss with olive oil, salt, and pepper in a large bowl. Return to the baking dish. Continue baking chickpeas, stirring halfway through, until golden and dry on the outside, about 22 minutes more. I make these all the time! sometimes I add Rosemary! DELICIOUS!!! THIS RECIPE IS SO CRUCIAL. The crunch is perfect and a little salt knocks it out of the park. so easy to make, highly recommended! Everyone loved these. I doubled the recipe and used our toaster oven to avoid heating up the kitchen. I added roasting time until they were crunchy. A delightful treat!